"ESPN RISE: Put yourself in charge of the high school sports world. What do you think needs to change the most? Marquise Goodwin: I think people should start testing for steroids and drug use in general because a lot of that goes on in the (high school) sports world ... If you have to cheat to win, it doesn't mean as much as if you did it on natural abilities and hard work. ESPN RISE: What do you think is the biggest challenge facing high school sports? Goodwin: The number of really good athletes is decreasing. People don't want to work as hard anymore and they complain. In the future, there probably won't be as many good athletes because they won't work as hard. The world is getting lazy." - Double world junior track & field champion Marquise Goodwin (LJ/4x100m) who will attend Texas next year as a football and track & field athlete. Drills: Do they work and how? Science Of Sport's Analysis Of Usain Bolt's Record Run In case you haven't seen the tall Jamaican blast the fastest 150m of all time, you can not only watch the race but read the blog's scientific analysis of his race. GO USA: "The US Endurance Model" - Top British Coach, Jim Harvey, Advocates Sending Top British Talent To US For Development Basically, he argues that the NCAA system pushes athletes to higher levels of performance because they're training at a higher level (i.e. running 100-mile weeks). LetsRun.com Message Board Helps A Guy Get Into Grad School - The Semantics Of Speed: The Difference Between Run And Jog Read the email and some of the paper for yourself. AP Review Of Chris McDougall's Born To Run: The book is on the NYTimes best seller list What really interested us was McDougall's research and visits to the Taramuhara Indians of Mexico. *Ritz On How And Why He Left Brad Hudson He's got big goals and he wants a change. *Will Claye Named USATF Athlete Of Week: He broke the American Jr record in the triple and won the Big 12 meet as a freshman Coincidentally, he wasn't the best young triple jumper in the world this weekend as a 17-year-old Chinese jumper beat him by about 20cm for a world 17y/o record. *Inspirational Brief Chat With The USA Men's Berlin Marathon Squad The US squad will be: Nate Jenkins, Fernando Cabada, Dan Browne, Matt Gabrielson and Justin Young. Great opportunity for a hard-working bunch. *Interesting Notes From The PAC-10 Meet In Eugene - Hayward Attendance DOWN From 2006 Also, we love the story about sprinter Allante Battle, who tied (to the 1/1000th of a second) for 8th in the prelims and had to run the final with only the other guy, then ran fast enough to nab third. LRC: The Week That Was We try to make sense of the big-time NCAA track and field conference action by comparing Oregon's distance prowess at the PAC-10 meet to Arkansas' at the SEC meet and sympathizing with sub-4 guys and 17-foot vaulters that can't score at conference. 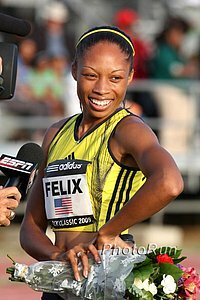 We also pause to read an email from one of the greatest legends in track and field history who is a LetsRun.com visitor in addition to being a two-time Olympic champ. Along the way we also admire Galen Rupp's kick and ponder, "Is there something wrong with Jacob Hernandez and is there something really special about LaShawn Merritt?" All that and much more. Reebok Announces Preliminary Lineups For May 30th Meet At Icahn Stadium In NYC The meet is going to be very, very good. Get your tickets now. New Yorkers show that, unlike LA, you care about track and field. Joe Battaglia On 7'8.75" High Jumper Jesse Williams And Weekend Action Williams missed the Olympic high jump final after coming in as a co-favorite, but he upped his PR this winter and is convinced he can compete with the best in the world. Simon Hart On How Charles Van Commenee Is Making Strides Where Dave Collins Failed Van Commenee is committed to attending events and helping coaches of elites do the best they can. He was on hand to watch star heptathlete Jessica Ennis set her heptathlon personal record last weekend. 14.35! Thousands Watch Usain Bolt Annihilate 150m World Record Geb takes the windy 10k in 27:34 as Bolt puts on a show, beating his nearest competition by an absurd 0.7 seconds. *Bolt's Last 100m Was 8.72! *Watch Replay Manchester Great City Games Men's 150m Final *Usain Bolt Interview *Watch Replay Of Entire Manchester City Games, Which Includes 10km As Well As Women's 150m. What happened? A ton. LaShawn Merritt absolutely crushed the men's 200 in a way that we've never even seen Usain Bolt win a 100 or 200. Bernard Lagat looked good as usual in the 1,500 as Manzano totally bombed along with Shalane Flanagan, who bombed in the 5k. Jenn S. jumped high as usual as well. Anna Willard looked like she'll get the AR in the steeple soon, as the meet was plagued by poor attendance and poor announcing and too many false starts and windy weather once again. *Remarkable: Belgian Bodybuilders Flee Championship Facility When Drug Testers Show Up Unannounced This tells you a lot about the "sport" of bodybuilding. *He'll Cash In Too: The Korean Version Of A-Rod (Cheater) Comes Clean In Book He was tipping off other players on pitches and was privy to the drug culture in Korea, a league where drug testing didn't start until 2007. *ESPN Interviews HS Star (Double World Junior Champ) Marquise Goodwin, He Says HS Authorities Need To Drug Test We like this guy. Jeremy Wariner On Going Back To Coach Clyde Hart The incredible LaShawn Merritt - Jeremy Wariner rivalry may be the extra motivation necessary to move MJ's 400m world record lower in the coming years. Merritt and Wariner opened up with 44-second 400s this year and Merritt looked phenomenal in his 200m win at Carson. Hopefully we'll see a few showdowns this year, including in the Berlin World Championships final. Bolt Says Of Course He Will Be Gunning For 2012 Bolt wants to be "a legend" and to do that, he wants to be on top in 2012 as well. *Josephat Ndambiri Goes Sub-27 Again In Blustery Conditions In Japan Prior to 2009 no person had ever broken 27 on Japanese soil and now Ndambiri has done it twice in less than a month. *NZ's Valerie Vili Has Huge 20.69 Throw In Brazil She's the best women's thrower in the world and may change nationalities to Great Britain. *17 Year-Old Chinese Triple Jumper Sets Age Group World Record 17.13m That is a monster jump for a youngster. *Kenia Sinclair Jamaica's Lone Winner In Carson This Weekend In The 1,500m It's pretty amazing their only win came in a distance event. *Galen Rupp's 54-Second Last Lap Leads Ducks To 26 Points In 10k Salazar: "Not bad for a kid who can't kick." Meet Preview: Arkansas Will Have Its Hands Full With Host Florida Bucknam: "A lot of things lean towards Florida winning this championship. By no means are they insurmountable odds." Big 10 Final Results *Team Scores Penn State women win by 1/3 1/4 point over Michigan! Minnesota wins Men's.